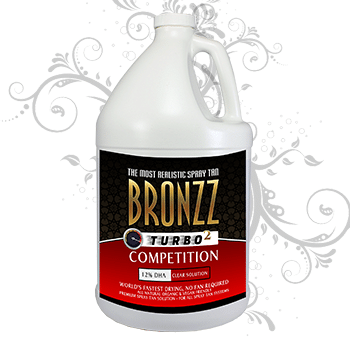 Bronzz Turbo 2 Spray Tan Solution – Competition Clear (No Cosmetic Bronzer) for HVLP Airbrush Tanning Systems, airbrush tan machines and spray tan machines. If you’re looking to improve your current airbrush tanning solution and have your clients raving about how realistic their spray tan is, you’ve found the #1 most realistic airbrush tanning solution in the world. Hypo-Allergenic spray tan solution formula, safe for even the most sensitive skin! 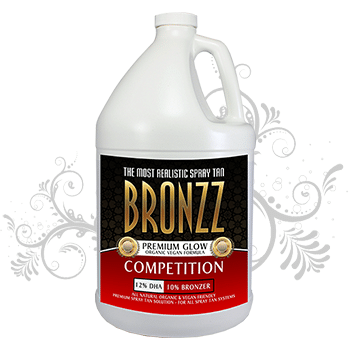 Spray tan solution for salons and airbrush tanning solution needs are available in 1/2 gallon, and 1-gallon sizes. Impress your clients with the most realistic sunless tan solution in the world, at a fraction of the cost of overpriced competitors! Our solution is guaranteed to be the best in the industry and is used by over 10,000 salons and spray tan technicians including mobile airbrush tanning artists currently in the USA alone. If you are ready to give your customers the most realistic airbrush tan or sunless spray tan of their lives, you have found the best airbrush tan solution made. Our airbrush tanning formula sunless tanning solution is compatible with all HVLP airbrush tan machines, sunless tanning machines, and spray tan machines. Our exclusive formula includes a new turbo dry ingredient that dries faster than any other spray tan. No blow drying! 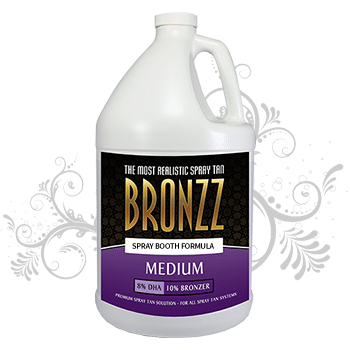 Purchase your spray tan solution in BULK for HUGE SAVINGS!